In the first part of this paper we have confirmed that Exodus 3:14 has long presented a very considerable challenge to translators and interpreters alike, ever since the writing of the Septuagint some 2,300 years ago. We have encountered many approaches to the translation of this verse and considered examples of its translation in several languages. In their renderings of the verse, some interpreters have retained the original or transliterated Hebrew of the four famously enigmatic words it contains. Others have translated them literally, while others again have rendered them periphrastically in order to express a particular understanding of their meaning. We have seen interpretations of Exodus 3:14 that have ranged from the exclusively religious of the Talmud and Midrash to the highly philosophical of Maimonides, from the exclusively rabbinic of Rashi to the inclusively synthetic of Sarna and Tigay, from the esotericism of Kabbalah to the scepticism of Propp. Two broad approaches to its interpretation have been identified as having dominated the many efforts that have been made, with the religious and personalistic on the one hand and the metaphysical and philosophical on the other. Proponents of the former have discovered meanings of a temporal kind in ehyeh asher ehyeh and ehyeh, while proponents of the latter have discovered in them statements of the absolute and eternal existence of God. Neither side has been able to convincingly support their respective positions and so neither side has won universal acceptance within Judaism. To this day these four words continue to be interpreted in strikingly different ways, ranging from the absolute existence of God to absolutely nothing at all. We have also seen a widespread awareness that there is a Divine name in this verse but that there is no universal agreement on what that name is and far less on what it means. The name has been variously identified as ehyeh asher ehyeh of 3:14a, the absolute ehyeh of 3:14b and even all three occurrences of ehyeh taken together, despite the fact that it is only the ehyeh of 3:14b that finds support in a plain reading of the biblical text. 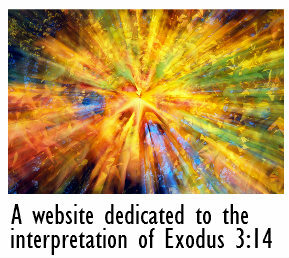 We have also seen many interpretations of Exodus 3:14 that have been based on an incorrect understanding of the biblical text, specifically those that identify ehyeh asher ehyeh as the words that Moses was to say to the Israelites instead of the obviously correct ehyeh of 3:14b, and that this traditionally and uncritically perpetuated error has led to the ongoing and widespread misidentification of ehyeh asher ehyeh as a Divine name. What we have not seen are interpretations that have measured up to the magnitude and significance of the revelation at the Burning Bush while at the same time making narrative and theological sense of the verse in its biblical context and corresponding linguistically to one of the universally accepted literal translations of the Hebrew text. It is therefore the case that more than two thousand years after the first translation of Exodus 3:14 was made, we are now no closer than we ever were to having either a confident or even commonly agreed understanding of what it is that God is communicating to Moses in this verse. However, what is most relevant to the second part of this paper is that we have seen ample support for the contention that the ehyeh of Exodus 3:14b is a Divine name and even that it is a very special Divine name. We have also encountered a widespread opinion amongst Jewish thinkers, grammarians and kabbalists that ehyeh is the first person equivalent of the third person name YHWH and that ehyeh has the same meaning as YHWH. Plainly stated, therefore, we have seen ample evidence that the Ehyeh of Exodus 3:14b has long been recognised in Judaism as the Personal name of God and YHWH as His proper name, where ‘Personal’ indicates the name by which God is known to Himself and ‘proper’ indicates the name most appropriately employed by His subjects in their addresses to Him and remembrances of Him.